Now can you guess who was taught wood work at school by Steve Coogan's Dad? Wanted to be a bin-man when he was a child? And has recently been interviewed by some scruffy looking chap from South London that talks like a cabbie? No. It's not Barry Manilow. It's some ferret fancier from up North. As seen in this 60-minute stage presentation recorded in 2012. In this special 'Channel Four' staged interview, the cockney cabbie of yesteryear, Danny Baker, asks the man with fun running through his bones, Peter Kay, a series of very engaging and revealing questions, relating to his time in show business. What now follows is a quick Q & A surmising the men in question. When did Peter first realise he was funny? At school, messing about with his teachers. Where does he his passion for comedy come from? Television. It's as though he was serving some sort of weird apprenticeship whilst growing up; gauging his parents reactions on the shows they were viewing on the old goggle box. What did Peter do for the BBC on his initial outing? Basically, what he used to do at home. Showing people what he thought was interesting, by relaying ads and other forms of tele-visual paraphernalia. 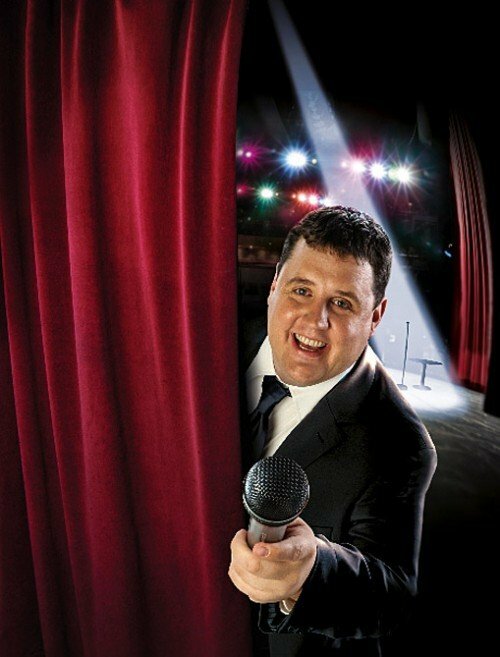 Why was Peter's first solo project the multi-caricatured comedy, 'The Peter Kay Thing'? He wanted to be another Ronnie Barker; and was very impressed with how Ronnie played two different characters, on the two different sitcoms -- 'Open All Hours' and 'Porridge' -- at the same age. Moreover, Peter also took note of something Woody Allen once said -- write what you know. Peter knows Bolton. What was the genesis of 'Phoenix Nights'? Peter became fascinated with the dying industry of Manchester's 'Club Land', due to the fact that his father took him to this type of establishment as a small child. Why did Peter populate the cast in this show with stand-up comics? To Mister Kay, comedians are basically actors; and can deliver a certain line in a certain way -- making it real -- like a Ken Loach film. What's his relationship like with his long time pal, Paddy McGuiness? Peter always thought Paddy was funny for as long as he's known him. In fact, one of the reasons why he called his character 'Paddy' in the show -- instead of 'Neil' or something -- was because otherwise Paddy wouldn't have known who Peter was referring to. What's Peters view on the Northern accent? It's funnier somehow. Something to do with the cuddly rhythm to the overall tone. Did Peter engage any adverse reactions to his drag act, Geraldine, from his reality spoof, 'Pop Star Superstar'? Yes. His mother didn't like it -- even though she took most of his wardrobe -- and certain members of the public thought that it was 'too real' for some reason. Peter wanted to do something completely different though; the opposite of what he had done previously. It's been five years since Peter did anything on television, why is that? Well, he wanted to strike a nice balance between his stand-up and his sitcoms. But he didn't get his way. Stand-up took over. In closing this interview, Peter tells Danny a joke about a wheelbarrow, and in turn a representative of the 'Guinness Book of Records' gives him an award for selling the highest number of tickets in recorded history. Well deserved. Very well deserved. Now before I tell you what I think about 'Peter Kay - In Conversation', please allow me to present you with some facts first. (1) Peter John Kay was born on the 2nd of July, 1973, in Farnworth, Lancashire, England. (2 Before he even thought about getting into comedy, Peter worked in a toilet roll factory, a 'Netto' supermarket, a 'Cash and Carry', a bingo hall, and his favorite job out of the bunch, at a local cinema. (3) Peter's got a GCSE in art from the school he attended in Bolton, called, the Mount St Joseph High School. And he's also got a Higher National Diploma in Media Performance at the University of Salford, in Manchester, as well. (4) Dave Spikey -- who was Peter's eventual co-star and co-writer in his hit sitcom, 'Phoenix Nights' -- was the host on the first stand-up competition he'd won. (5) In nigh on everything he does, Peter tries his best to reference the ventriloquist double-act, Bob Carolgees and Spit the dog. (6) Peter's television debut was in a 25-minute Granada produced television skit entitled 'Two Minutes'. It co-starred Alexei Sayle and Paul Shane. (7) Whilst Peter was making a name for himself on the comedy circuit, he was the warm-up act on the chat show, 'Parkinson'. (8) Although Peter has appeared in many funny television commercials for 'John Smiths' Bitter, he doesn't actually drink alcohol. OK, so now that I've gotten that out of my system, I hope you know a little bit more about Peter Kay, just like I have after watching him in 'Peter Kay - In Conversation'. Honestly. This programme was really great to watch. It was funny. Revealing. Insightful. Congenial. And had a nice way of showing us who Peter is as a person, without it seeming too promotional by default. In my opinion, Peter lives the life every class-clowns dreams of. Not in an envious way. Of course not. Peter's too charming to make a decent person feel envy. But rather in that re-collective manner, of 'Boy-oh-boy! I wished I was in his shoes'. Plus this is a point he himself raises subliminally though-out this show; emphasised in Peter's monologue prior to him performing his stand-up gig. Yeah. Straight up. There were times throughout this interview I said to myself 'Oh! I did that'. Or 'My God! That's a bit like me!'. Because Peter comes across a very analytical and astute comedian by nature, constantly striving to do his best with whatever he comes up with. Also, I did like how Danny Baker enhanced this programme with his knowledgeable posturing, asking the right question at the right time, and making this piece more about 'Peter the man', than 'Peter the comic'.